Ottawa real estate developer Bruce Firestone decided along with colleagues Cyril Leeder and Randy Sexton that Ottawa was now able to support an NHL franchise, and the group proceeded to put a bid together. His firm, Terrace Investments, did not have the liquid assets to finance the expansion fee and the team, but the group conceived a strategy to leverage a land development. 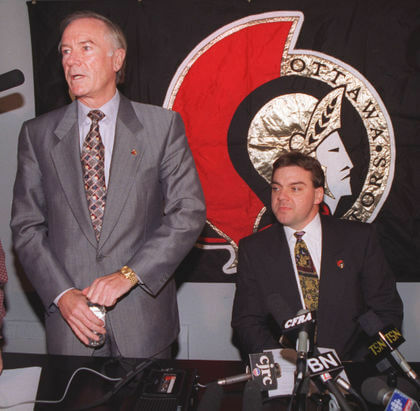 In 1989, after finding a suitable site on farmland just west of Ottawa in Kanata on which to construct a new arena, Terrace announced its intention to win a franchise and launched a successful “Bring Back the Senators” campaign to both woo the public and persuade the NHL that the city could support an NHL franchise. Public support was high and the group would secure over 11,000 season ticket pledges. On December 12, 1990, the NHL approved a new franchise for Firestone’s group, to start play in the 1992 – 1993 season. 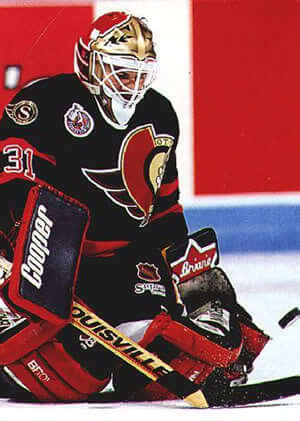 In 1992, Rod Bryden became CEO of Terrace Corporation, the principal owner of the new Ottawa Senators NHL franchise. In 1993, he became the franchise’s Chairman and Governor. In 1994, construction on the Palladium arena (later the Corel Centre and Scotiabank Place, Now the Canadian Tire Centre) was begun by the Palladium Corporation, of which Bryden was the owner and chairman. The arena opened in 1996. As part of its bid to land a NHL franchise for Ottawa, Terrace Corporation unveiled the original proposal for the arena development at a press conference in September 1989. The proposal included a hotel and 20,500 seat arena, named The Palladium on 100 acres (0.40 km2), surrounded by a 500-acre (2.0 km2) mini-city, named “West Terrace.” The site itself, 600 acres (2.4 km2) of farmland, on the western border of Kanata, had been acquired in May 1989 by Terrace. Rezoning approval was granted by the Board on August 28, 1991, with conditions. The conditions imposed by the board included a scaling down of the arena to 18,500 seats, a moratorium on development outside the initial 100-acre (0.40 km2) arena site, and that the cost of the highway interchange with highway 417 be paid by Terrace. A two-year period was used seeking financing for the site and interchange by Terrace Corporation. The corporation received a $6 million grant from the federal government, but needed to borrow to pay for the rest of the costs of construction. A ground-breaking ceremony was held in June 1992 but actual construction did not start until July 7, 1994. Actual construction took 18 months, finishing in January 1996. On August 26, 2003, Eugene Melnyk purchased the Ottawa Senators hockey club of the NHL and their arena, Corel Centre out of bankruptcy. He is the sole owner and holds the titles of governor and chairman. Eugene has repeatedly stated that the team is not for sale and he would never consider selling it. Although the Ottawa Senators are a Canadian ice hockey club, the team yields little to no profit year to year. In the 2012 – 2013 season, the average ticket prices of the Ottawa Senators were fifth cheapest in the league; Colorado, Dallas, Tampa Bay, and Phoenix were the only cheaper tickets. The Ottawa Senators are a professional ice hockey team based in Ottawa, Ontario, Canada. They are members of the Atlantic Division of the Eastern Conference of the National Hockey League (NHL). 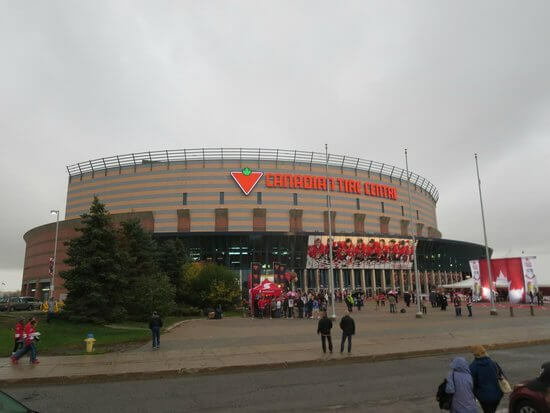 The Senators play their home games at the 18,694 seat (20,041 capacity) Canadian Tire Centre which opened in 1996. Founded and established by Ottawa real estate developer Bruce Firestone, the team is the second NHL franchise to use the Ottawa Senators name. The original Ottawa Senators, founded in 1883, had a famed history, winning 11 Stanley Cups and playing in the NHL from 1917 until 1934. On December 6, 1990, after a two-year public campaign by Firestone, the NHL awarded a new franchise, which began play in the 1992 – 1993 season. 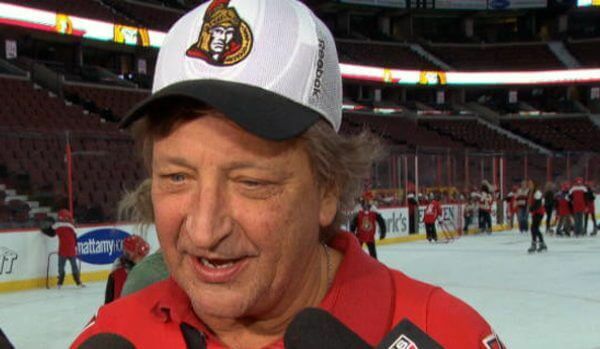 The current team owner is Eugene Melnyk, and in 2016, the franchise was valued by Forbes magazine at US$355 million. Senators – When a new NHL team returned to Ottawa in 1992 after a nearly 60-year hiatus, the nickname, reflecting Ottawa’s role as the nation’s capital and home of its Parliament. Who is the greatest Ottawa Senators? The Ottawa Senators are a professional ice hockey team based in Ottawa, Ontario, Canada.